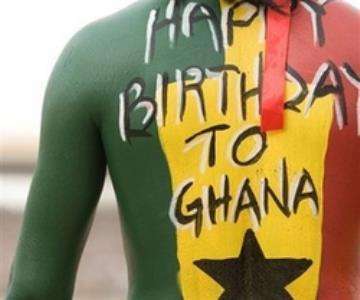 6 March this year was the 60th anniversary of Ghana’s independence from British rule. Celebrations are going on throughout the year and those of you who follow Darkowaa’s excellent blog African Book Addict! will have seen her 3-part series GH at 60 | Our Writers & Their Books which looked at 75 Ghanaian writers and certainly caused my TBR to reach even more astronomical heights. As an attempt to reduce the mountain by at least 2, this week I’m looking at 2 novels by writers of Ghanaian heritage. It’s also one more stop on my Around the World in 80 Books Reading Challenge, hosted by Hard Book Habit. Happy Anniversary Ghana! Firstly, Half Blood Blues by Esi Edugyan (2011) which was shortlisted for both the Orange Prize (as it then was) and the Booker, and won the Giller Prize. Narrated by jazz musician Sid Griffiths, it tells the story of jazz prodigy Hieronymous Falk, a 19 year old ‘Mischling’ (half white European, half black African) and the band he plays in, trying to carry on working in Europe under threat from the Nazis during the Second World War. The narrative shifts between 1939-40 in the build up to when Hiero is arrested and sent to a concentration camp; and 1992, where Sid and his frenemy Chip attend a documentary about Hiero and then undertake a journey to Poland. The documentary and journey force Sid to look back on probably the most complex, confusing time of his life. He was a young man, there was sexual jealousy and musical rivalry, and there is survivors’ guilt. Sid could pass for white and had fake papers, but at what price? Secondly, Homegoing, the debut novel by Yaa Gyasi (2016). Recently I’ve found that contemporary novels garnering hype and rapturous reviews are leaving me distinctly underwhelmed so I approached Homegoing with some trepidation. But I will add to the hype surrounding this novel by suggesting I think it deserved #ALLTHEPLAUDITS. It was hugely ambitious, and I thought Gyasi totally pulled it off, which is just astonishing considering it’s her first novel. Her sister Esi meanwhile, is trapped in the dungeons of The Castle, to be exported as part of the slave trade. They don’t know about one another, and subsequent chapters alternate between the stories of their descendants, some in Ghana, some in the United States. Each generation is tracked through, and Gyasi demonstrates that just because slavery ends, the subjugation and marginalisation of people of colour does not. Gyasi’s ambition is huge: Homecoming tracks over 200 years of history to demonstrate how the legacy of slavery survives to this day. That she does this through a compelling story with people you care about despite only being with them for a chapter marks her out as a formidable storyteller. At times I found Homecoming an almost unbearable read. The injustice, the violence, the depravity of what human beings can do to one another, turning a blind eye in the acquisition of money, made it an incredibly tough read in places. Gyasi does not dwell on violence, but nor does she shy away from the realities of what she is depicting. Gyasi is a huge talent, and a writer with something important to say. I’m really excited to see what she does next.